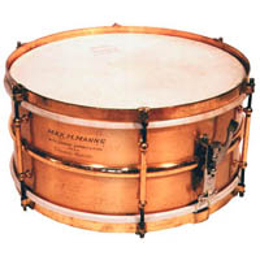 The 6-lug, 6-1/2 x 14 inch, gold-plated drumA hollow cylindrical shell of any size that has a head stretched over one or both ends and is b... belonged to Max H. Manne, Shelly Manne’s father. It was a gift from Vernon Castle, who, with his wife, formed a famous ballroom dancing duo. 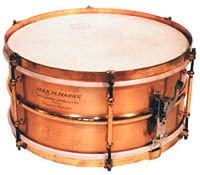 This was the first gold-plated drum manufactured by Ludwig & Ludwig and was presented to Manne when he left Castle’s orchestra to become manager of productions at the new Roxy Theatre in New York. On loan from Elden ‘Buster’ BaileyClose-up of the inscription showing the dedication from Castle to Manne.